Did I already mention that I love the style of Imaginext and Playskool figures? Well one part of it has to do with the characters that have found their way into this format, a couple of which happen to be the subject of today’s review. 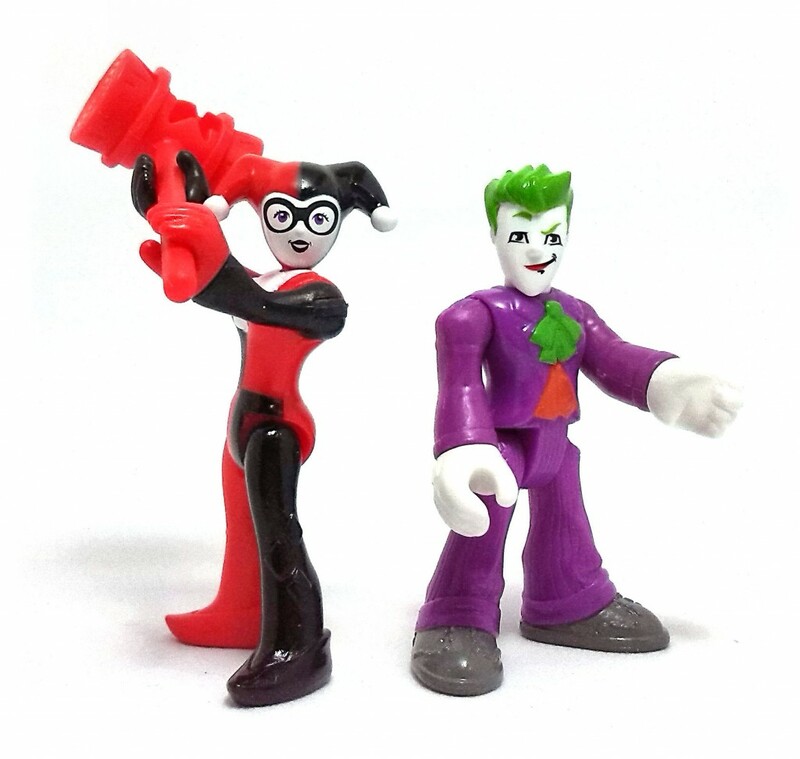 Harley Quinn & Joker came out in 2014 in the DC Super Friends Imaginext line, and they both are quite interesting figures to look at. Harley Quinn is an oddity within the line, being female and a new to the line, but what really drove me to her is that she is depicted wearing her classic harlequin costume instead of her Arkham togs. 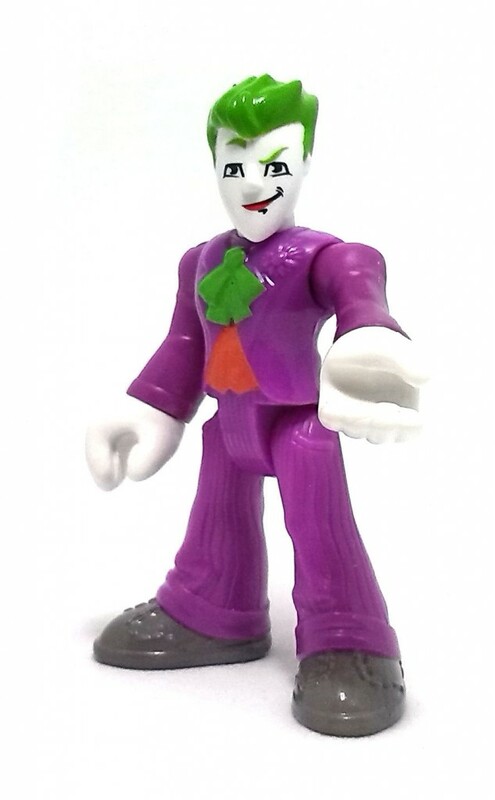 Joker, on the other hand, is a character we have had already several times in the Fisher Price Imaginext line, but this time around the figure sports a new head sculpture that looks more animated than the previous version and also added wrist articulation. 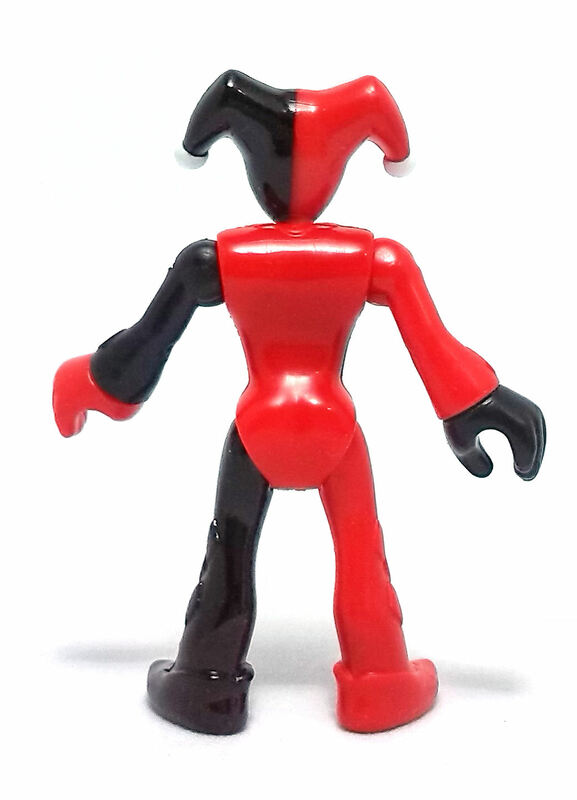 Articulation on both clowns is similar and consists on the usual Imaginext model of injected shoulders, swivel wrists and necks as well as uni-hip swivels. Given the slender silhouette of both characters, all of the joints work remarkably well. These figures have very little paint applied to them, as most of their pieces are molded in the final color of plastic, although they still get some extra deco. In general, the paintjob on both characters is pretty decent, with the face drawings on both of them being very crisp and expressive. 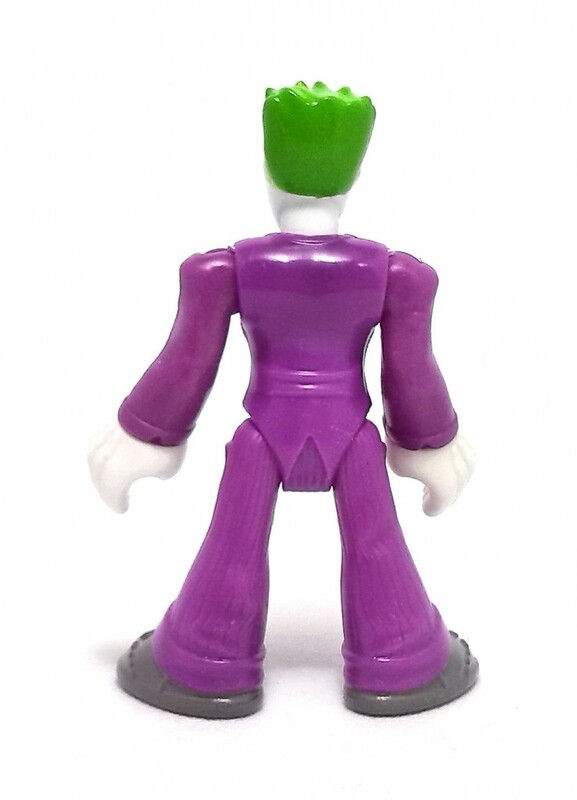 Joker is the most conspicuous of the pair, with the stark white plastic offering a nice contrast to the green, red and purple bits. On Harley, though, Mattel cheaped-out and painted only the front of the costume in the quartered red/black color scheme, and they also skimped on painting the diamond designs sculpted onto her legs. Also, the edges of the white costume element on Harley are rather sloppy, which brings her appearance down a notch. 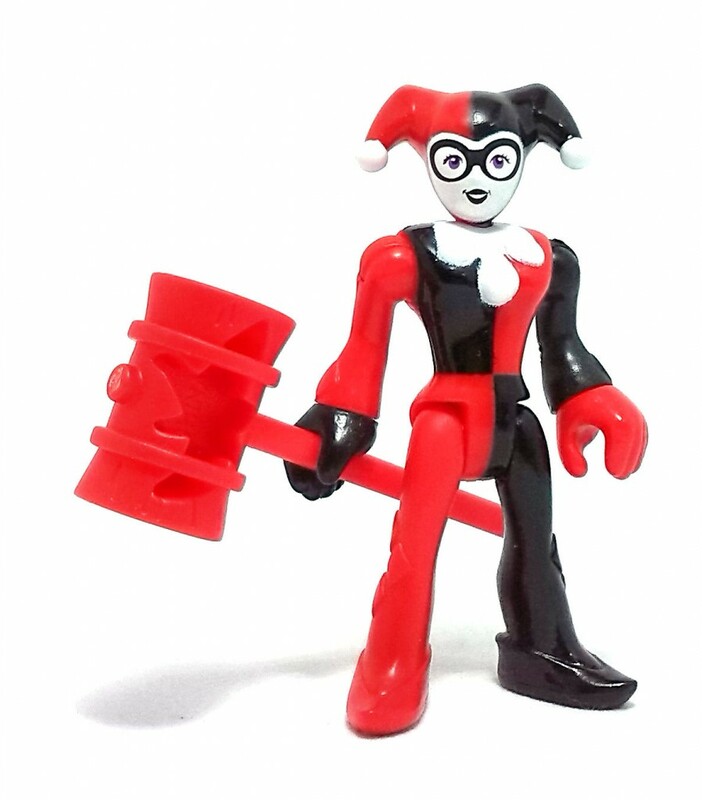 Accessory-wise, the set only includes a big red hammer for Harley, hollowed out to lighten it up and save on plastic. This piece lacks any decoration, but Harley can grab it two-handed without problem. 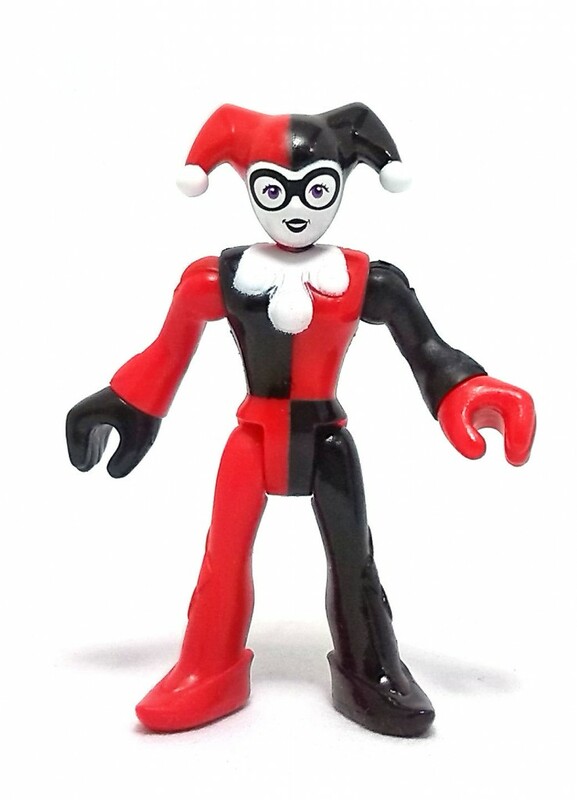 All things considered, I ended liking the Joker figure more than Harley, even though she was the main reason I wanted the set in the first place.